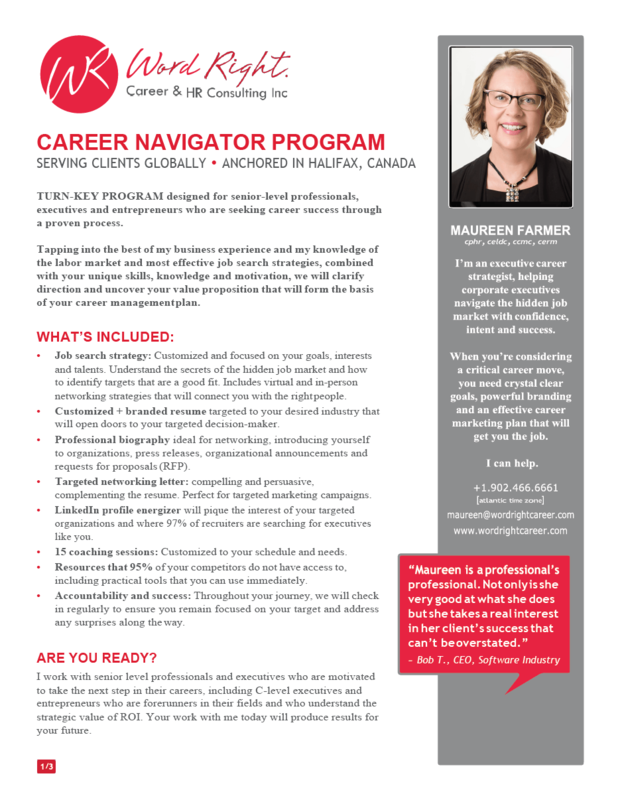 Stay updated on career navigation strategies. Now you need a plan to build on that achievement. ﻿﻿﻿﻿﻿Building a career is like building a business--it's time to be strategic. 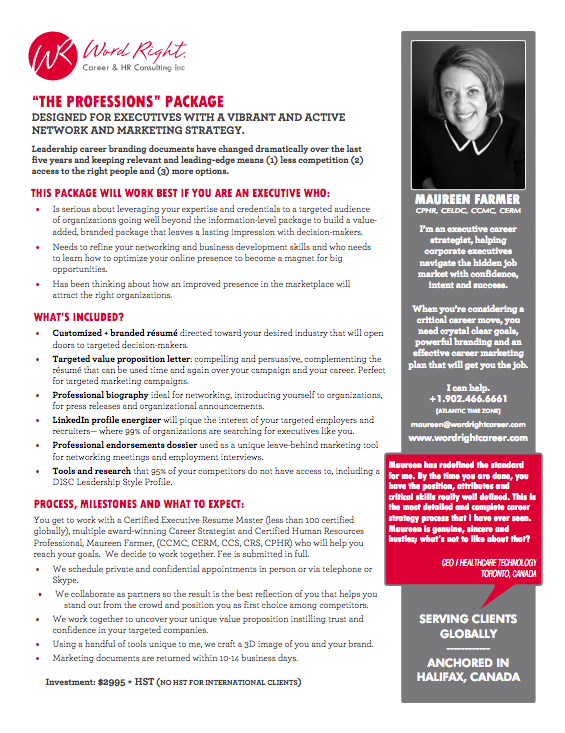 I’m Maureen Farmer and I’m an awarding-winning, executive career strategist. 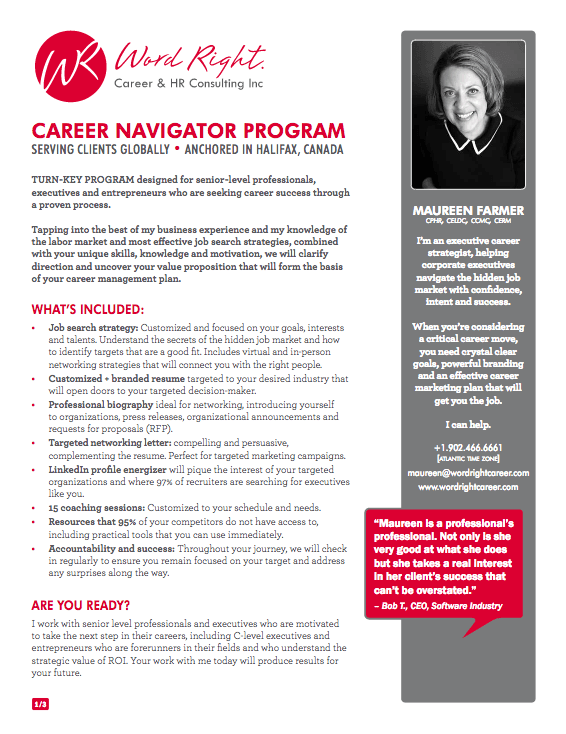 Together we will produce a powerful strategy for taking charge of your career. 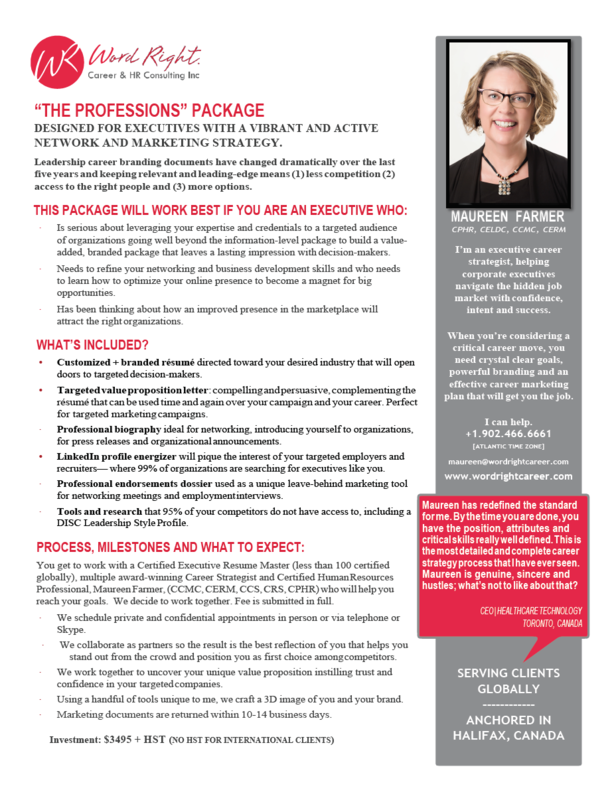 As a multiple award-winning executive career strategist with 25+ years’ experience, I have worked with hundreds of executives from around the world faced with the daunting task of finding their next opportunity. In their search for a new executive position, most struggle with reaching out and following up because they don’t know what to say or how to say it. After years of enjoying well-earned success, suddenly you find that you need a customized career plan and executive career strategist that can help you open the right doors and position you for your next executive role. 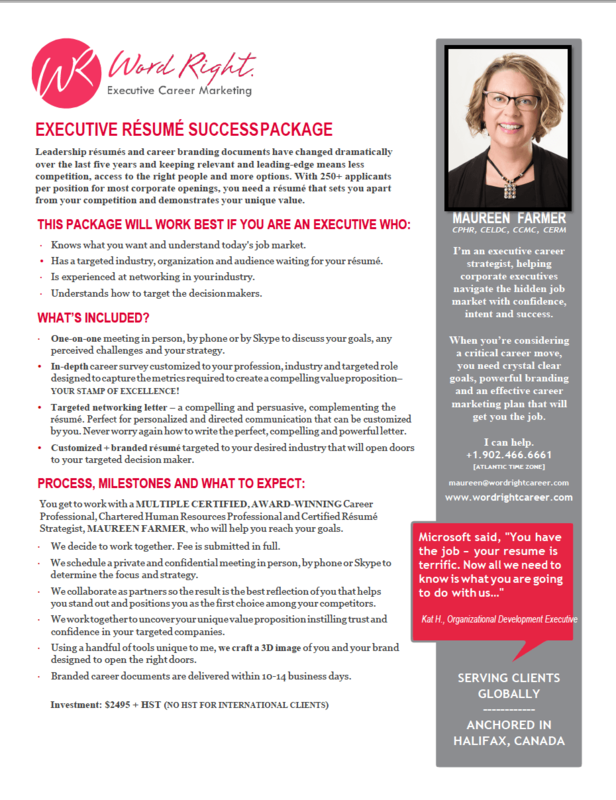 Perhaps you’re not even sure what executive career services you need and even where to start. But I do. Contact me. Together, we’ll articulate your career story – honestly and accurately. We’ll clearly showcase your accomplishments, illustrate your reputation and distinguish you from your peers. We’ll build you a resume that reflects you and your accomplishments. And then I’ll guide you to the hidden job market. ﻿When faced with the daunting task of finding their next opportunity, most everyone worries that their accomplishments don’t measure up to industry standards. It’s been my experience as an executive career strategist that executives have a unique list of trials to face that cause them to worry. One of the most important aspects of my work is to alleviate worry and guide them on the path to their next executive position. 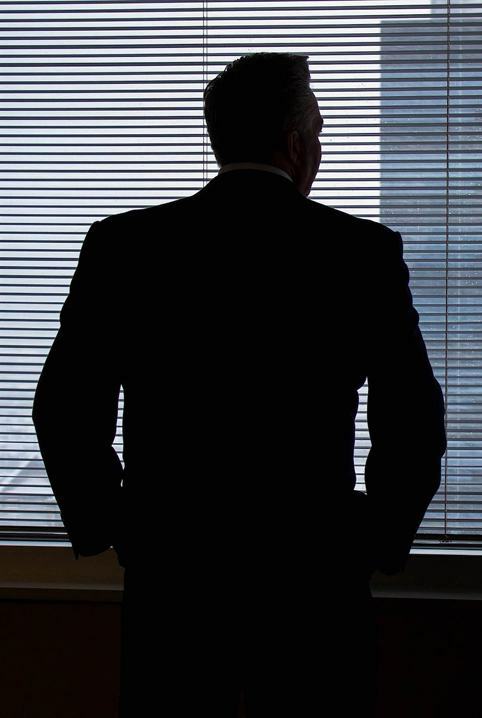 The C-level executives and professionals who turned to me have had a number of worries. Because they were recruited out of university, they’ve never done a job search before. They don’t know where to begin. Which leads to: they don't have a completed degree and fear that will disqualify them from other positions of equal or greater responsibility. 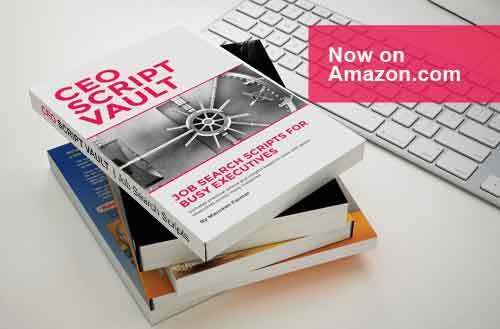 Although they are competent writers, they have no time for resume writing, to create a job search plan and write the other necessary career documents. They’ve worked in one industry their entire career. How can they translate their skills and accomplishments to another? They need a plan B if there is a merger, acquisition or a change at the Board level, leaving them in a vulnerable position. With corporate changes, if they got fired how would they position this to a decision maker? They don't understand how to market themselves. They feel they're too old. They will let their family down. They have no one to confide in and no one to trust. Work with me and we'll get you the attention of decision makers.